Refugees waiting at Tripoli International Airport, Libya, for their evacuation flight to Niger on 16 October 2018. 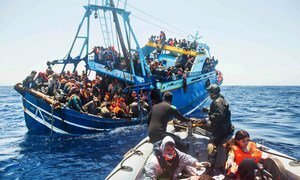 Denouncing the dangers faced by migrants and asylum seekers in Libya, the UN refugee agency (UNHCR) called on Friday for an end to their detention and advised those intercepting or rescuing them at sea against returning them to a country where they face “squalid conditions”. “It is reprehensible that they are detained instead of protected. This is despite the fact that viable alternatives to detention within Libya can be found, including through a Gathering and Departure Facility that we have been waiting to open since July, which could offer immediate protection and safety for those most vulnerable,” said Mr. Mignone. As many refugees remain in Libya and in need of urgent evacuation, UNHCR urges more countries to come forward with additional possibilities of places for their safe resettlement. Amid increasingly violent clashes between rival armed groups in Libya’s capital,Tripoli, the UN refugee agency (UNHCR) has successfully airlifted 135 migrants and refugees to safety in Niger.